Backups are quite essential for every personal computer or workstation users. And as the Windows 10 launch is just about the corner, I was looking for a new and advanced system backup tool that have all the new generation of features. 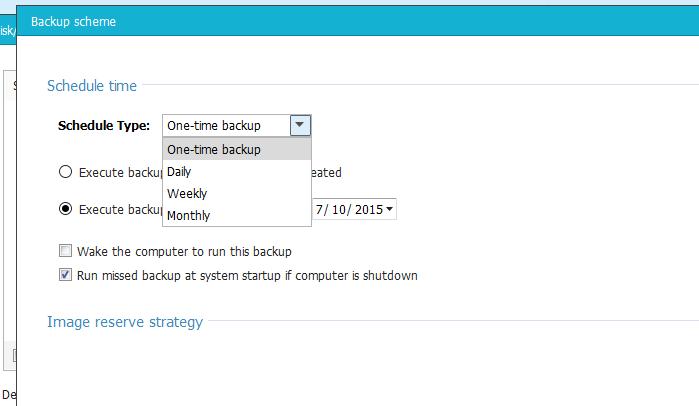 I found EaseUS Todo Backup Free tool, that is not only great for windows 10 system backup, but has the most versatile set of features, that you can access absolutely free. So after diving deep into its features for about 10 days, here is my in-depth review. There are multiple ways you can take backups with this free software, starting from small folder backups to the complete system backup, you can expect all the necessary features available right into this tool. Taking a quick back-up of your complete PC, hard drive partition, or folders is extremely simple. You just have to select what you want to back up, the folders or the drives, and allot the destination folder, where you want to keep this backup. You can use the advance options like Scheduling, Performance, Smart Backups and Encryption, which I have discussed in detail below. This is something I wanted all my life from a backup tool. For a kind of new operating systems, troubleshooting and geeky stuff we do, it is very likely that my C drive needs a quick format. And every single time, I have to copy all my Desktop, Pictures, Videos & Documents to another drive nd perform the format. So it’s like additional 2 hours of time-waste prior to doing the 15-minutes installation. 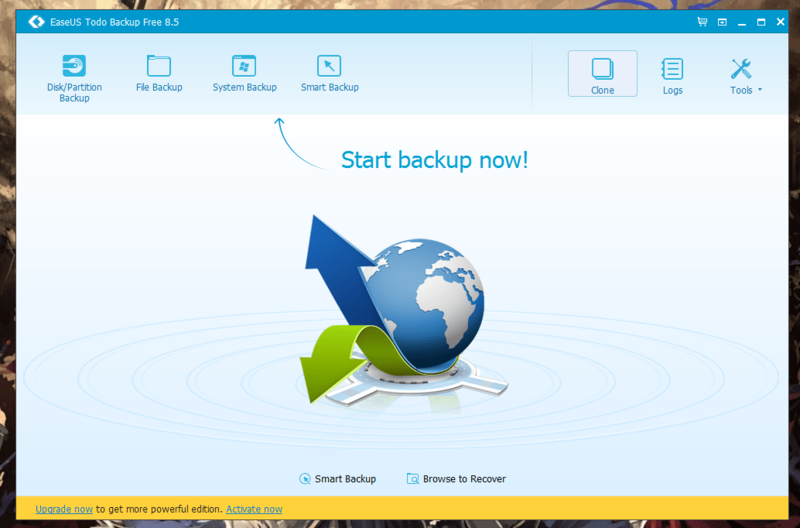 Smart Backup by EaseUS is already programmed to take the backup of your folders in the root directory, where you have installed the Windows OS. It takes backup of all important folders automatically. You can additionally customize and save extra folders that are not selected by default. 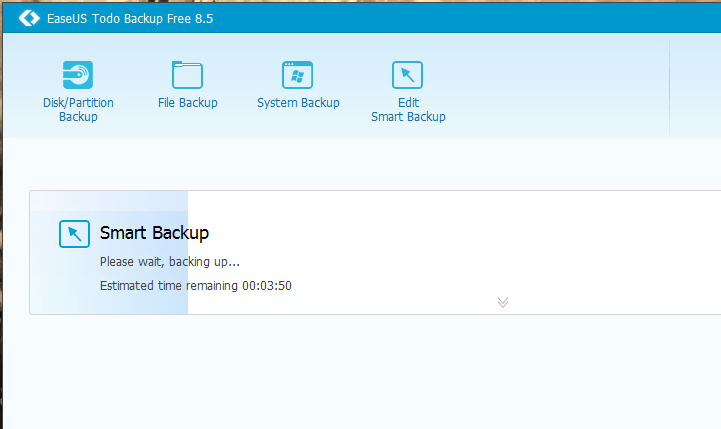 Just click on the Smart Backup icon on the top, and you will see the progress of backup happening in real time. Once you have the backup you can simply click on recovery button, and provide the destination to recover the backed-up image. 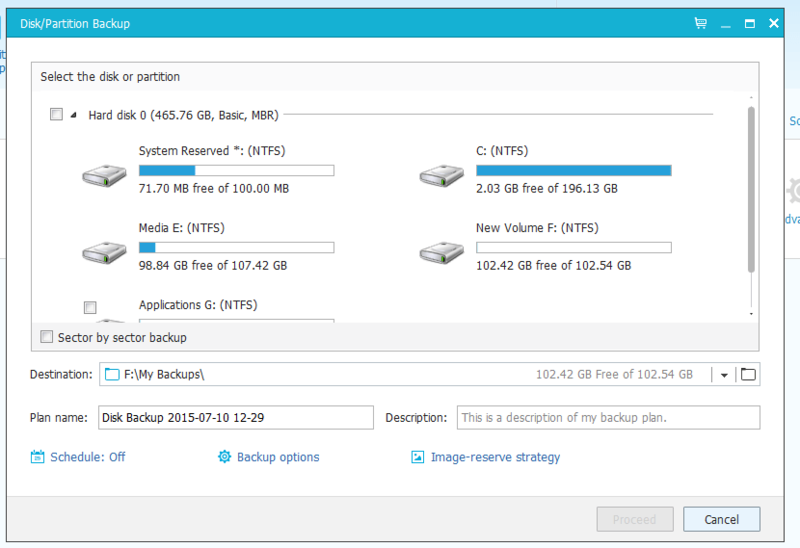 When you take the folder, file or partition backups you can customize advanced options. Just click on the backup options below your backup window, and you will ding these three options – Space, Encryption & Performance. Compression will help you compress your backup from normal, medium to high settings. 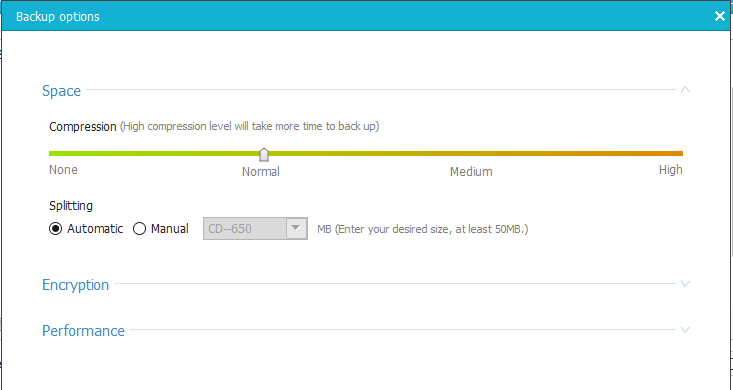 Higher the compression option, the more time it will take to backup/restore, but size of the backup will be very small. This is great in case you have less storage space on your backup drive. I would recommend normal backup, considering high speed of taking and restoring backups. You can automatically or manually split the backed up data, in case you want to store them on multiple DVDs, CDs or dedicated storage drives. Encryption is a simple password protection for your backups, that will ensure the security of your backed-up data. 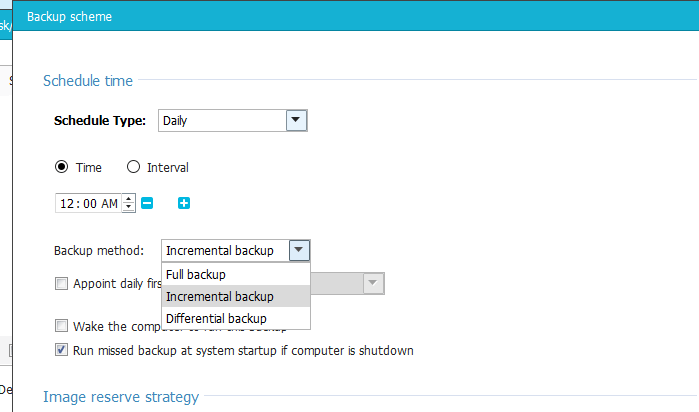 Performance – The third option on the backup option will let you set the back up process to high or low performance. If you give high priority to this tool, It will consume more system resources, meaning that your PC might slow down, but your backup process will be done a lot faster. I will only recommend high priority in case you have high performance system specifications same as or above Core i5 Processor, 4 of GB RAM and a SSD. 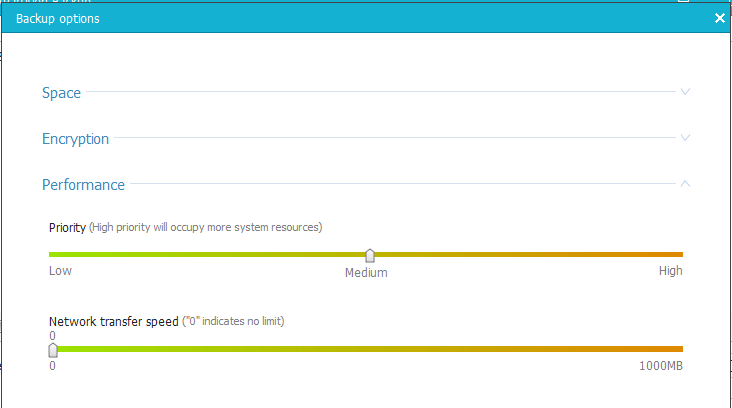 You can also set the network speed, upto 1000 MBPS or keep it as default unlimited speed as per your requirement. I tried these additional options, and they worked flawless for my laptop and home PC. They did not slow down any processes considering the tool was at its default settings. Additionally, you can select the backup methods from Incremental, Differential and Full Backup according to your requirements. 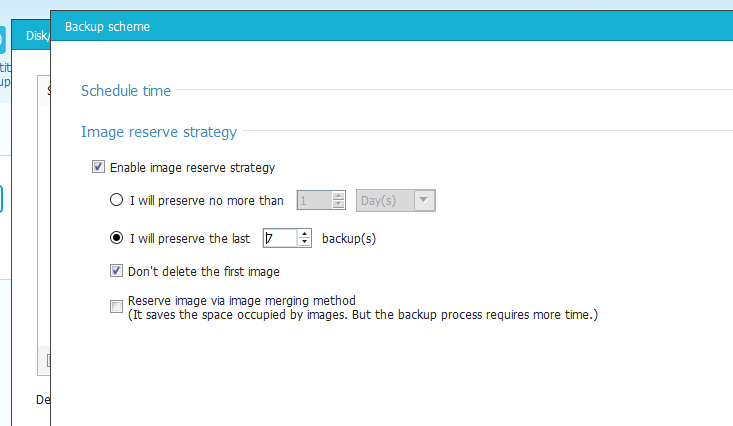 The Image Reserve Strategy will help you save a ton of storage space by not keeping backups for more than you need. This feature is quite useful, when you take multiple files or data backup on daily basis, and are short on space. 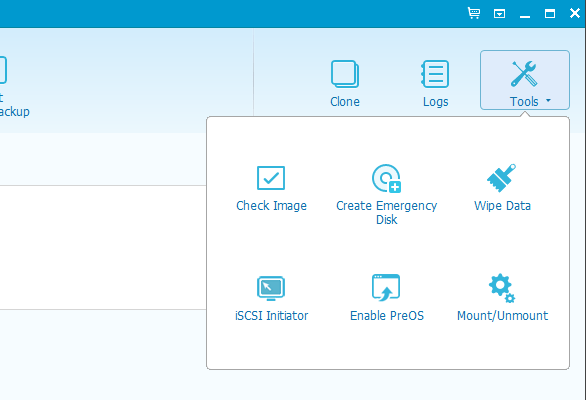 In addition to all these, you have more features like checking Image integrity, create emergency disk, Wipe Data, iSCSI initiator, Mount/Unmount and PreOS Enabling. Some of these can be useful to home users, but most of them are great for workstation or office users. It saves downloading and installing different tools for the separate tasks, that can optimize your PC. You can also clone your hard drive entirely using this free software, here is a simple guide from the developers to learn how to clone hdd to ssd. All these great features are available in a simple software, that works great with Windows 7, Windows 8.1 and Windows 10 Beta Preview I tested with. If you are looking for additional technical support for commercial use, want to transfer files between PC, Virtual PC and VMware and looking for even faster solution, you can consider upgrading to the EaseUS Todo Backup Pro version starting for just USD 23.99.